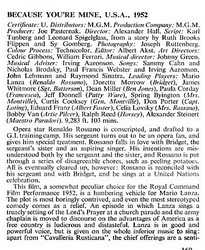 Armando Cesari, Vince di Placido, LeeAnn Cafferata, Derek McGovern, and Stefanie Walzinger contributed articles to the press sections. 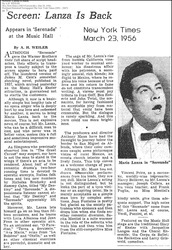 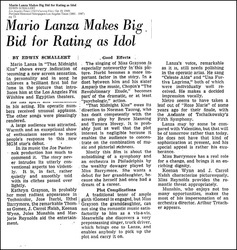 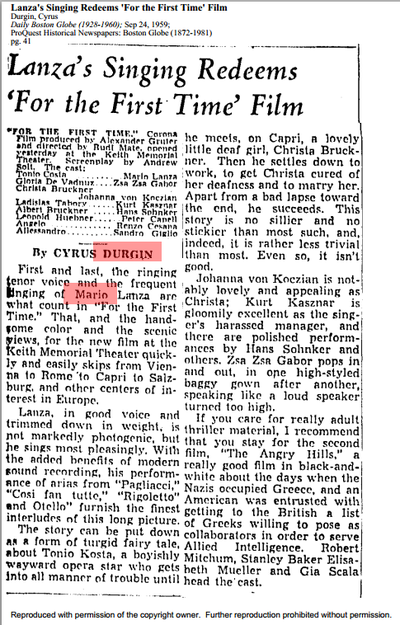 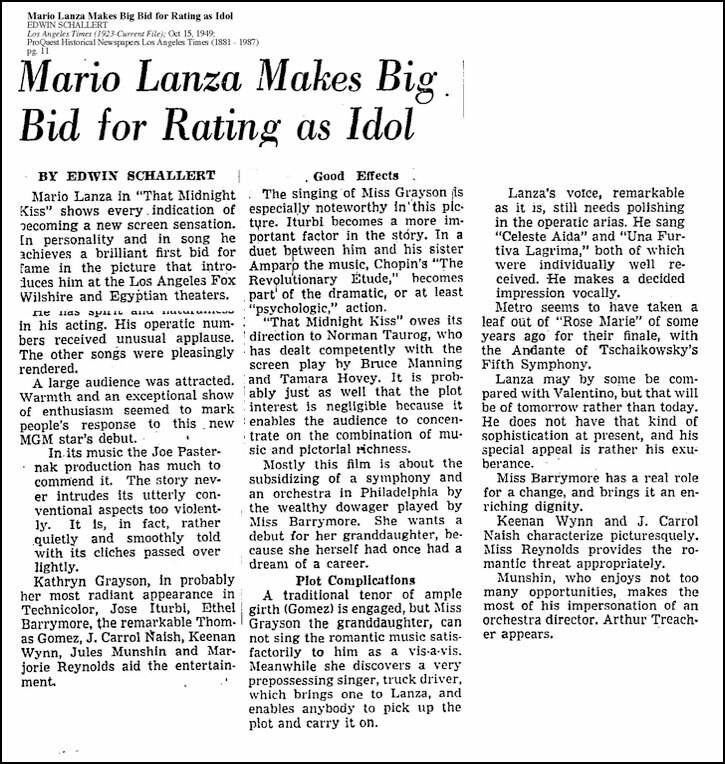 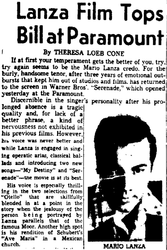 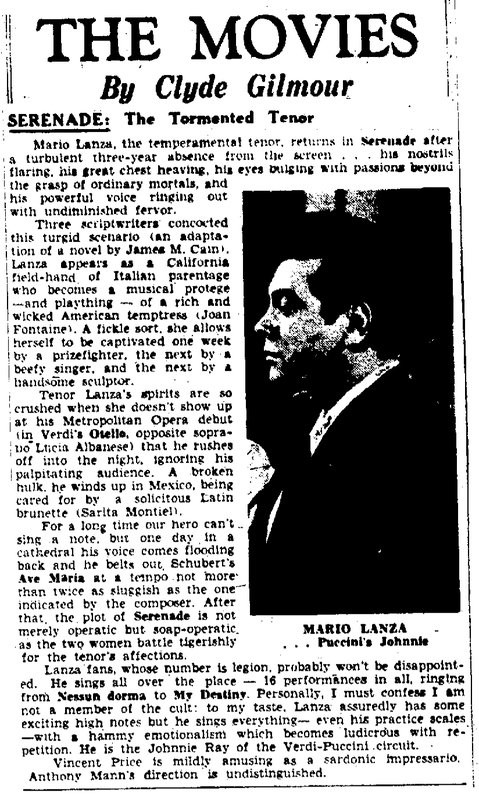 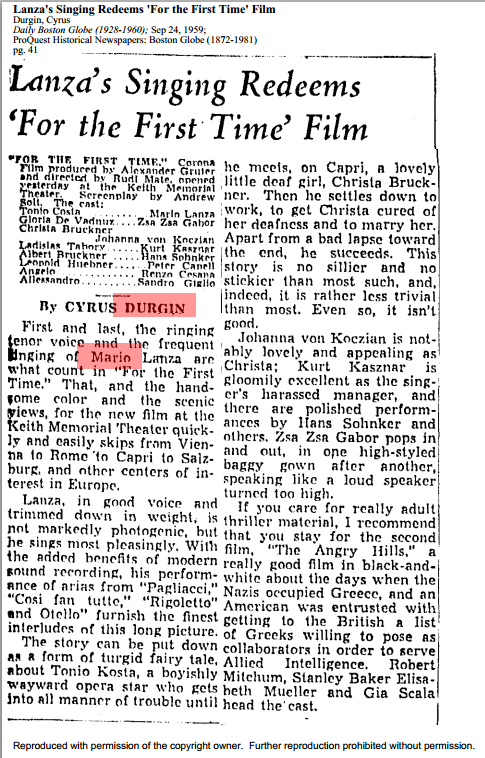 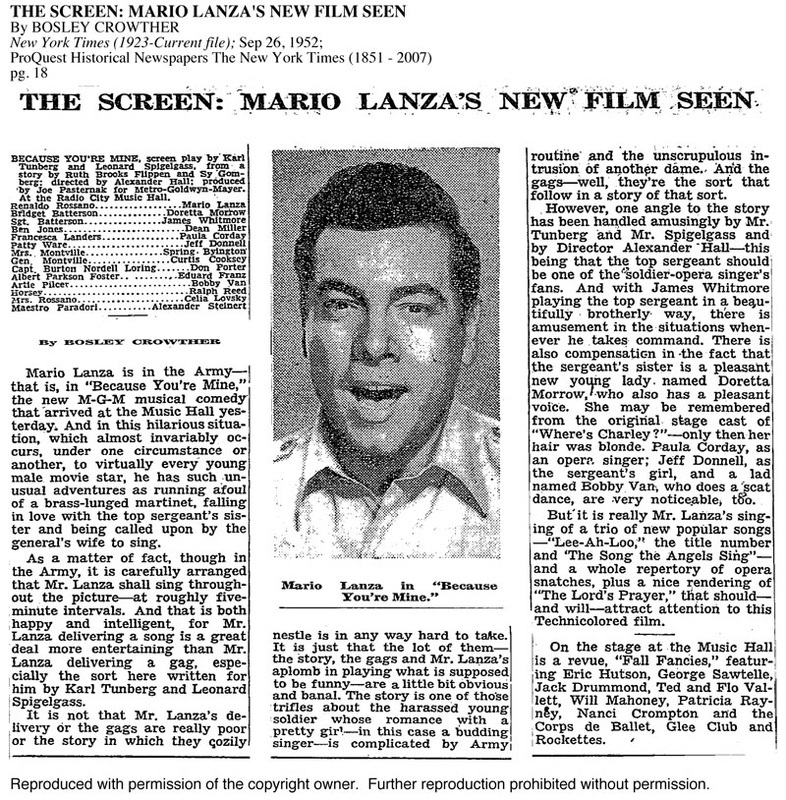 Mario Lanza appeared in seven movies. 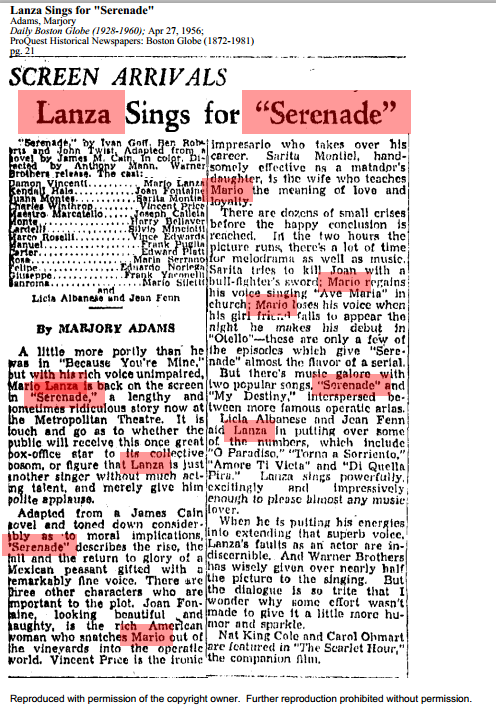 Film reviewers both praised and panned film plots and productions, often crediting Lanza's voice, personality, and interaction with other actors as the highlight of a film, and sometimes writing harsh criticism. 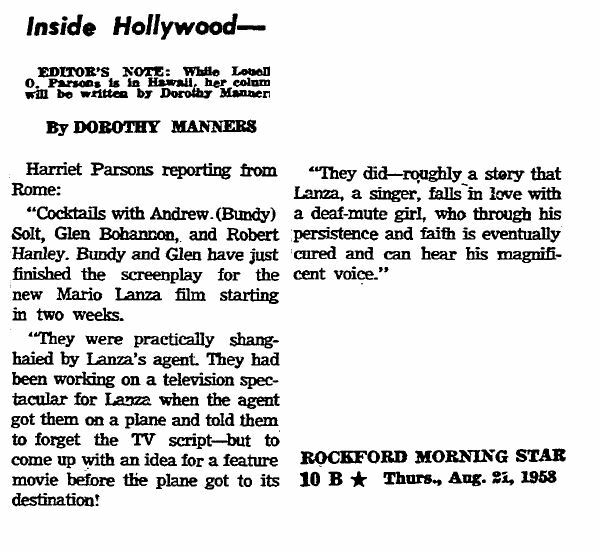 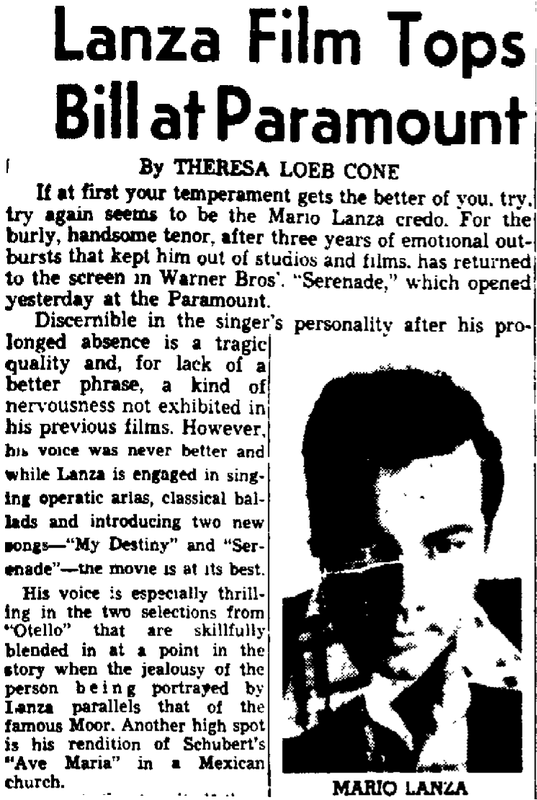 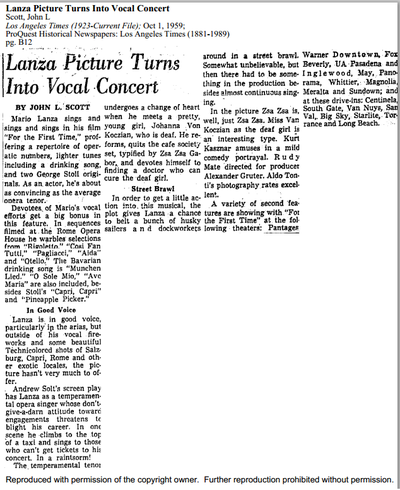 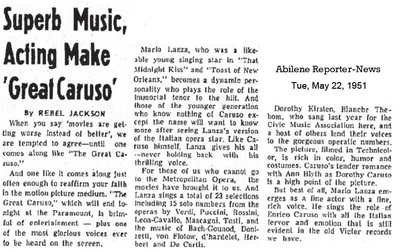 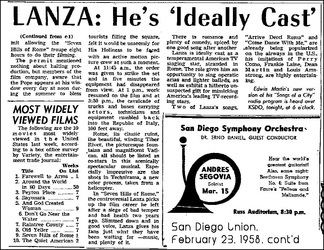 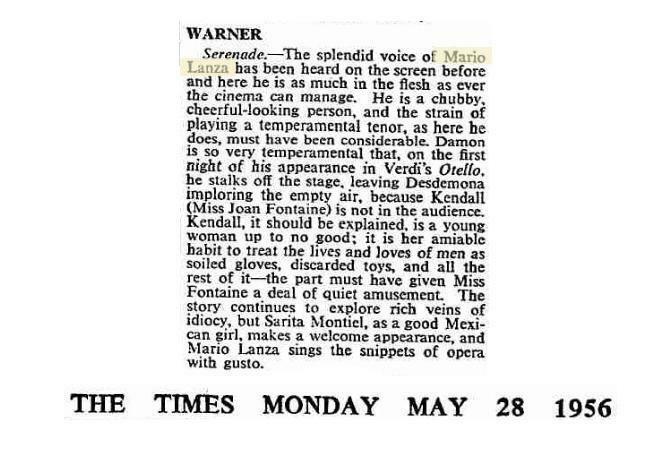 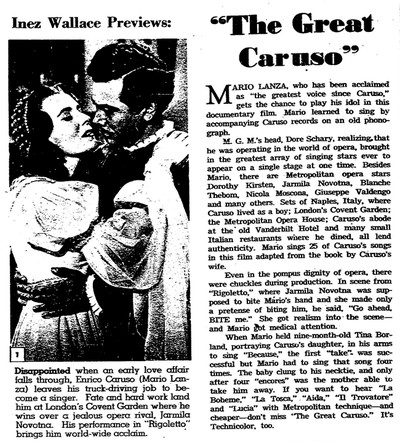 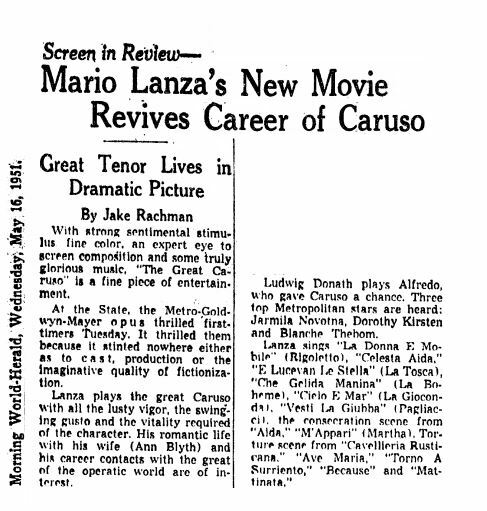 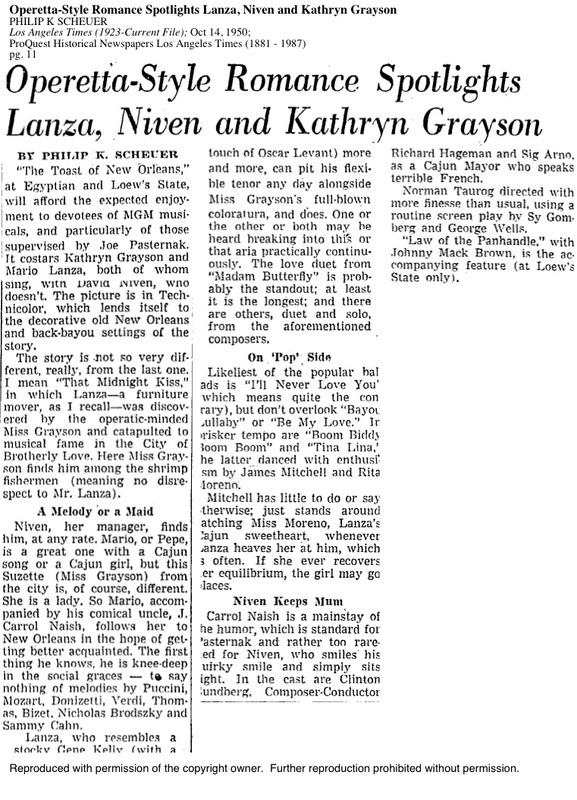 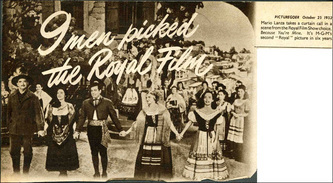 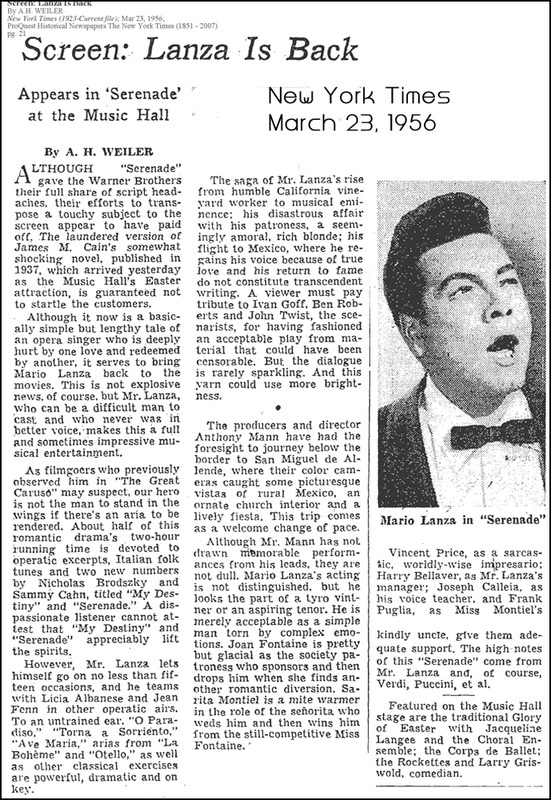 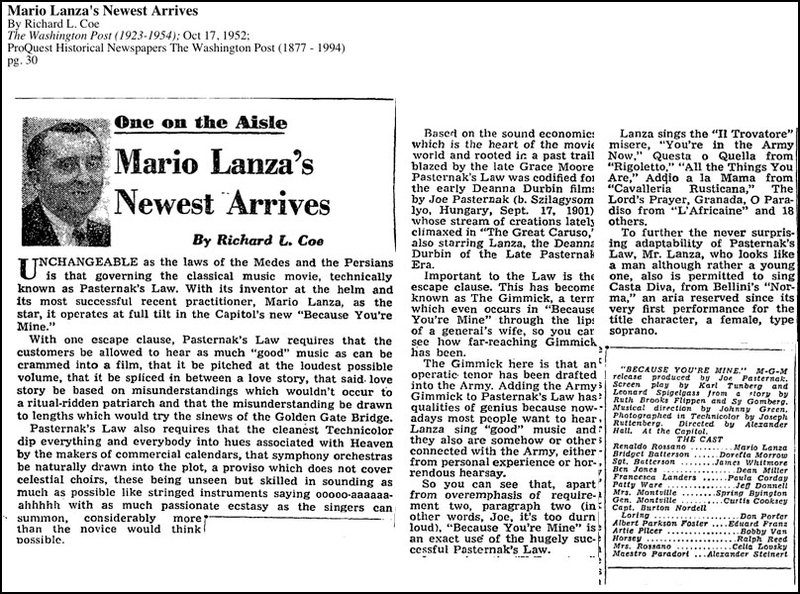 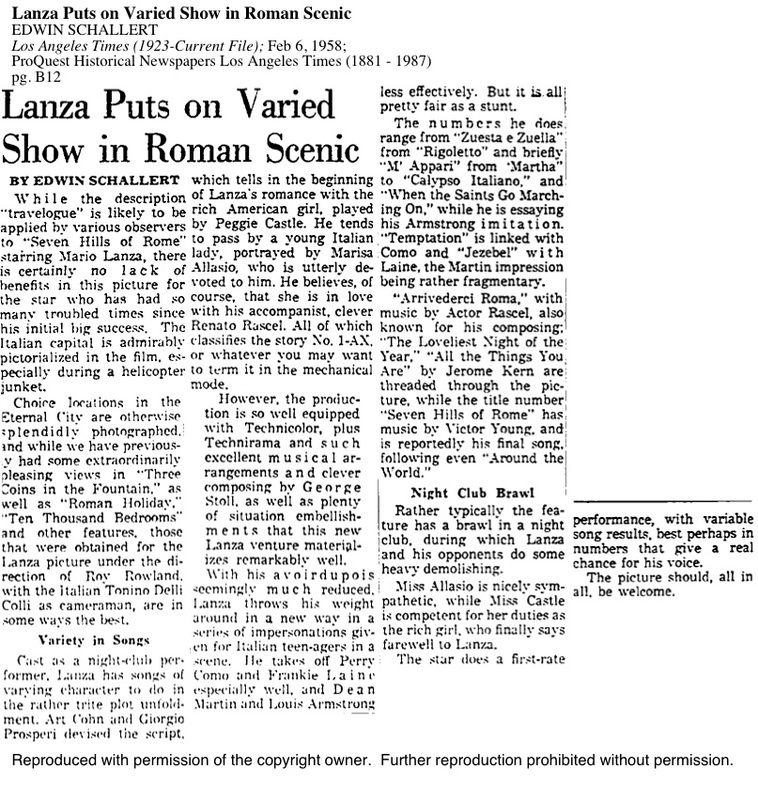 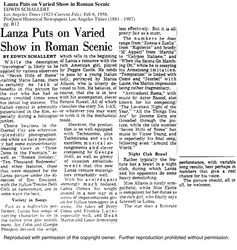 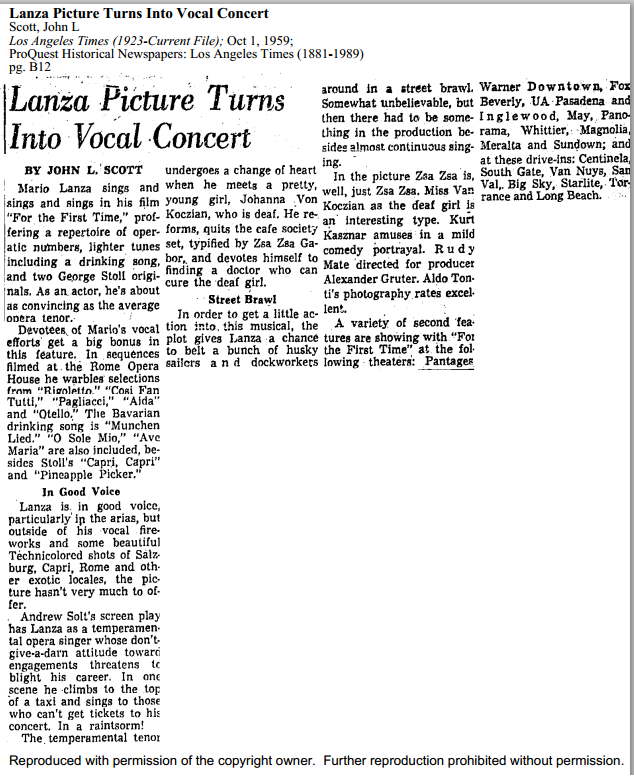 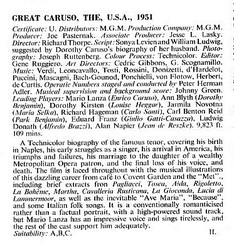 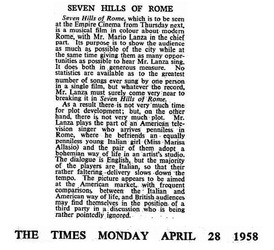 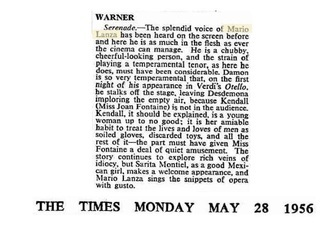 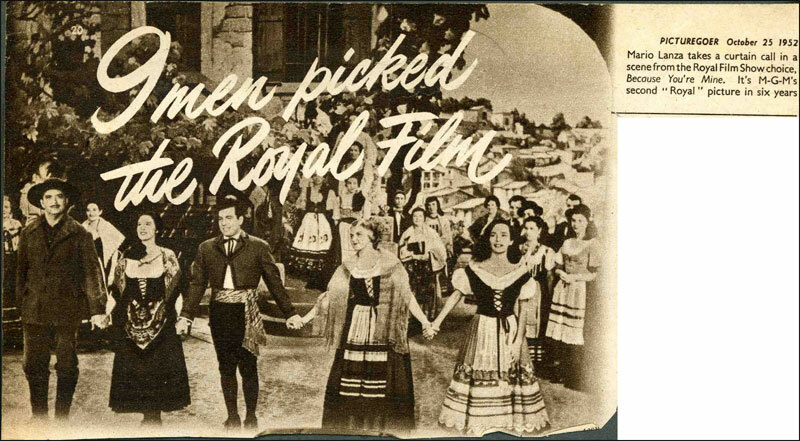 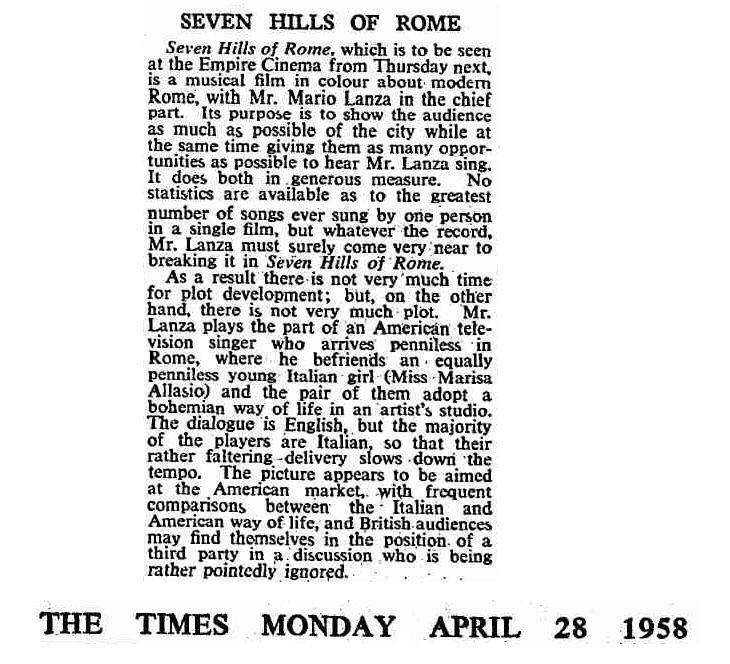 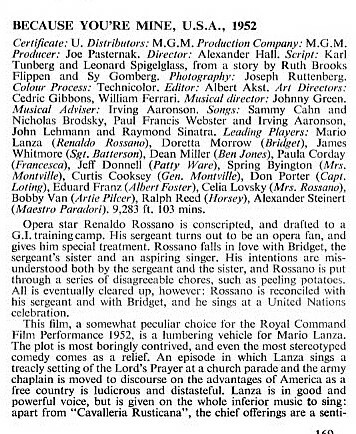 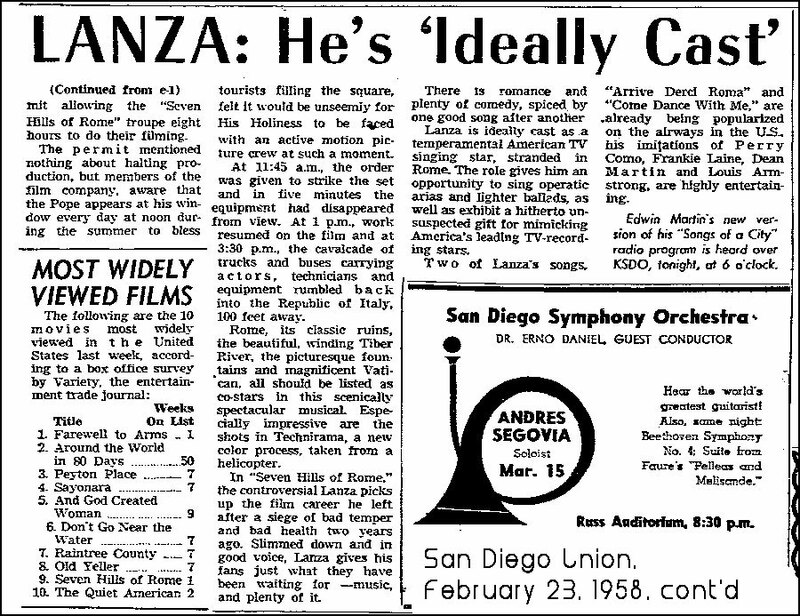 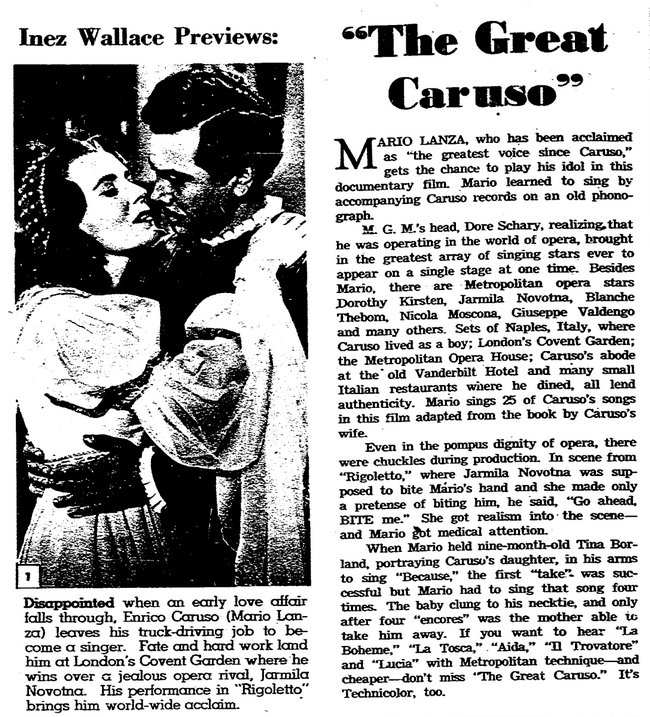 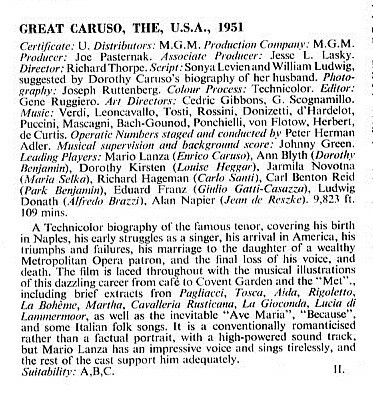 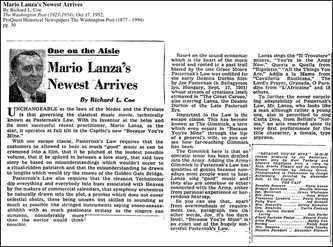 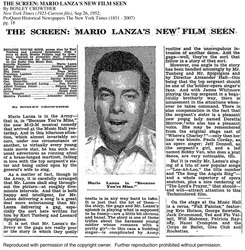 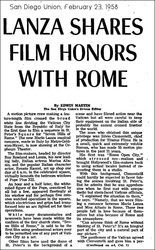 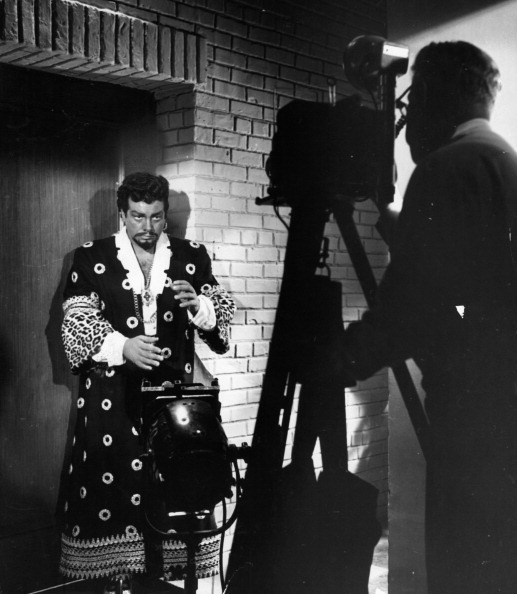 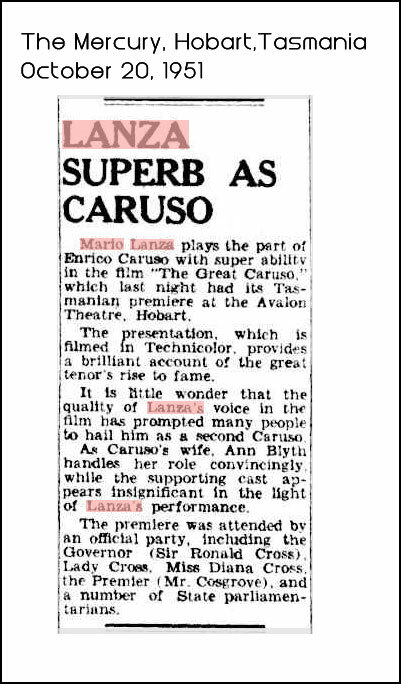 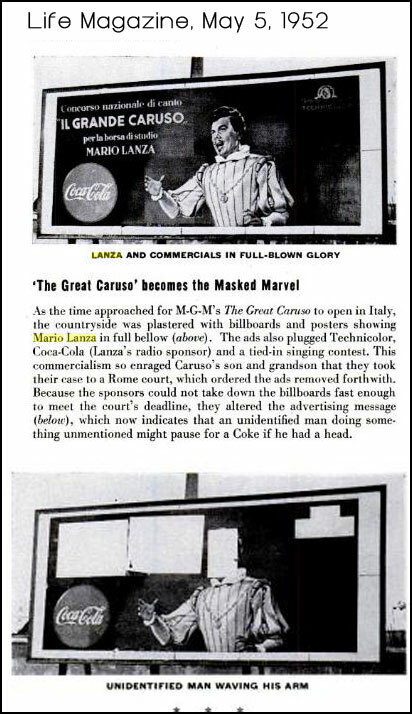 In his essay The Films of Mario Lanza, Derek McGovern summarizes and reviews Lanza's seven movies, all of which have been officially released on DVD by Warner Brothers. 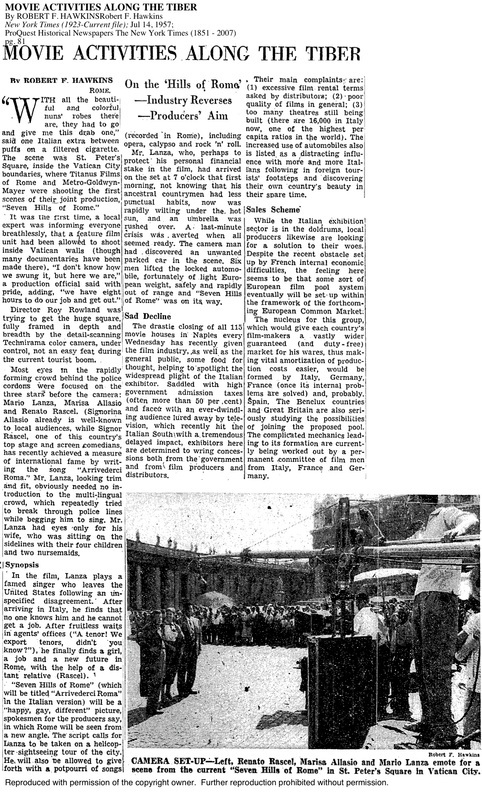 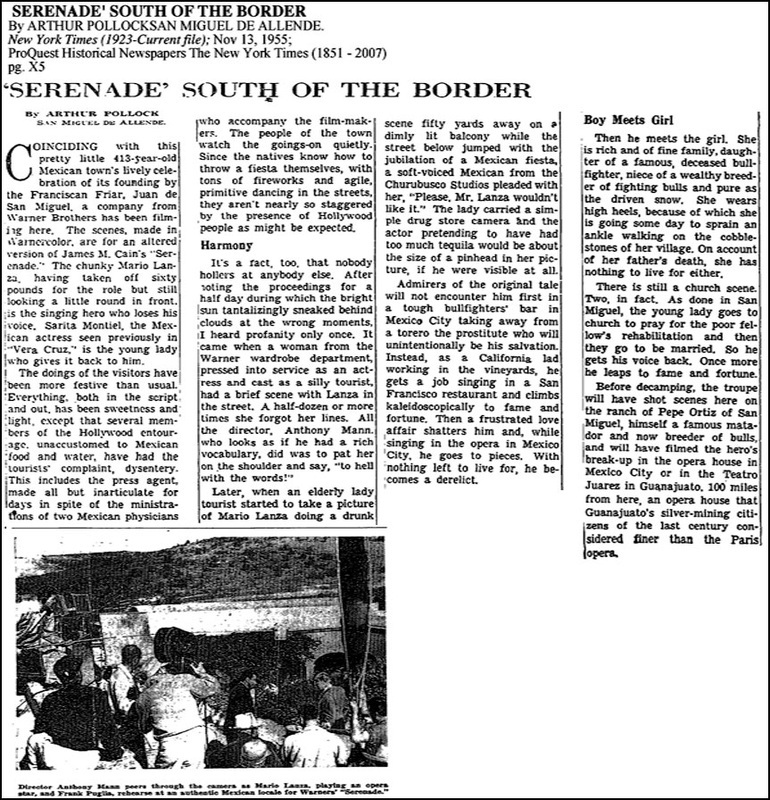 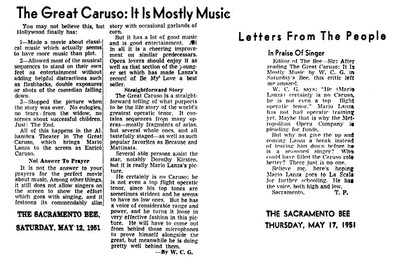 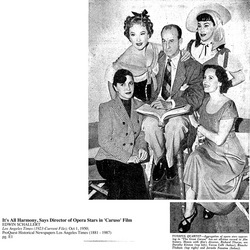 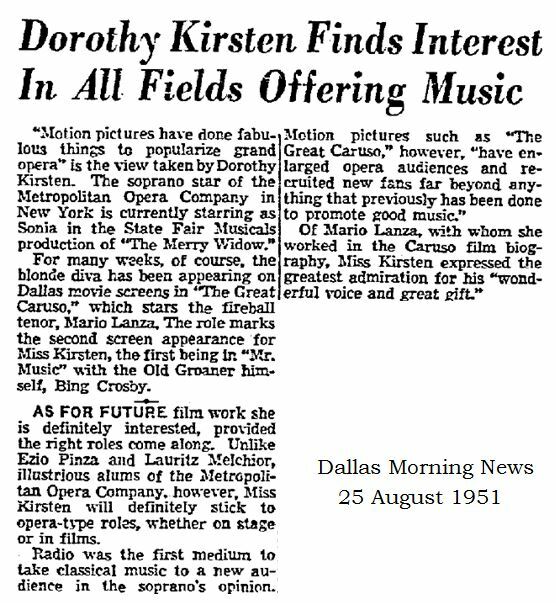 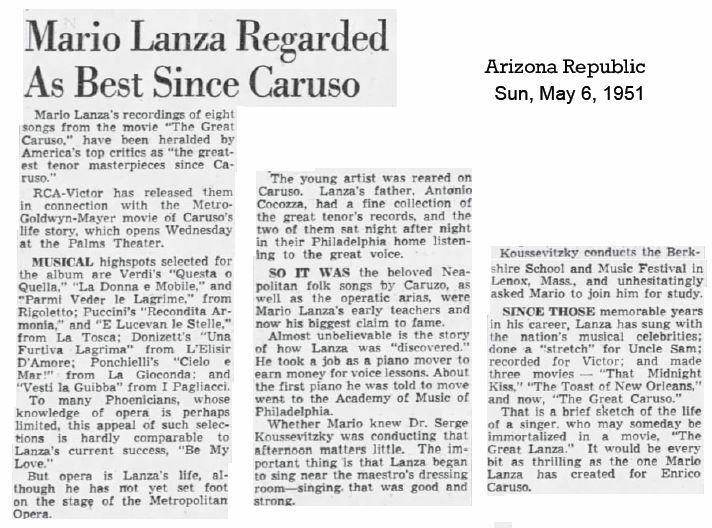 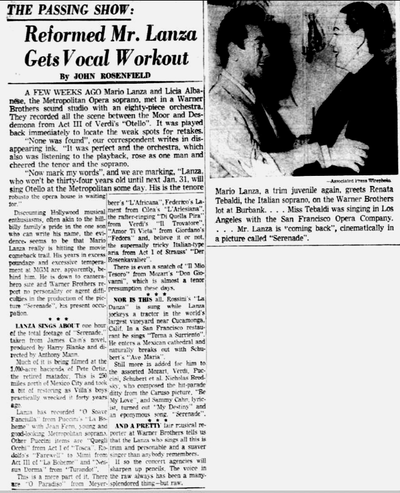 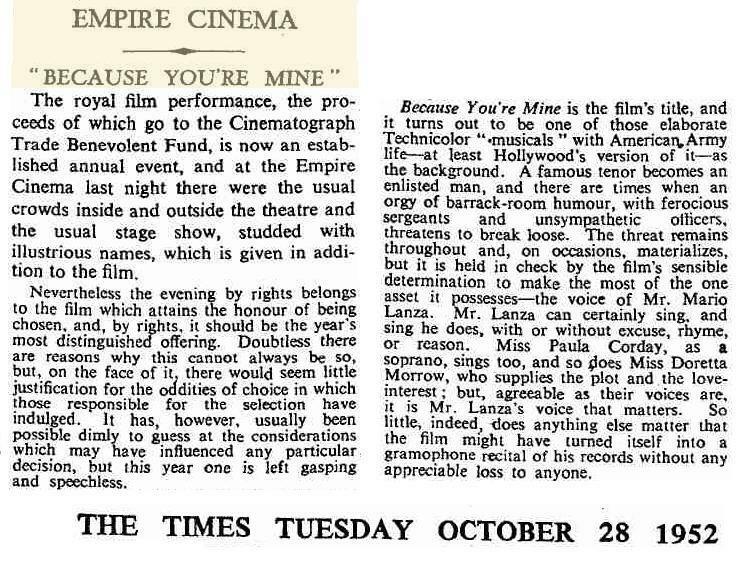 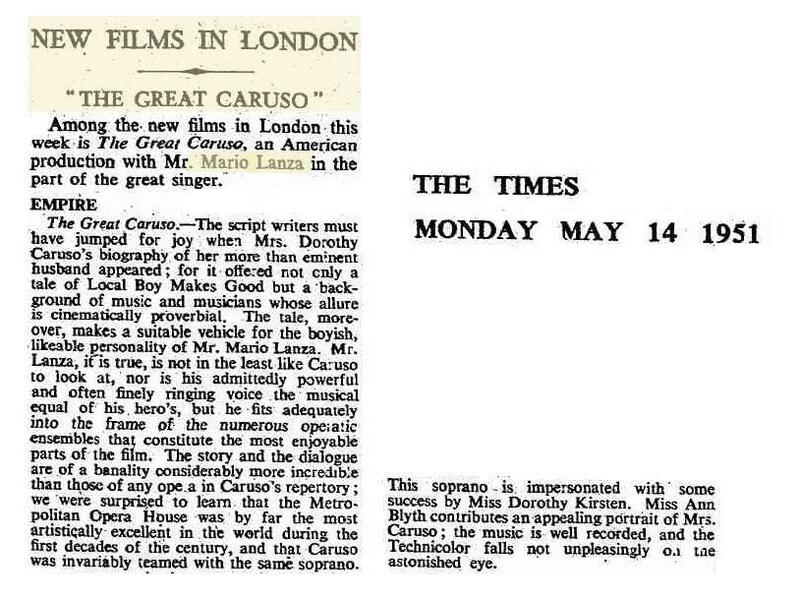 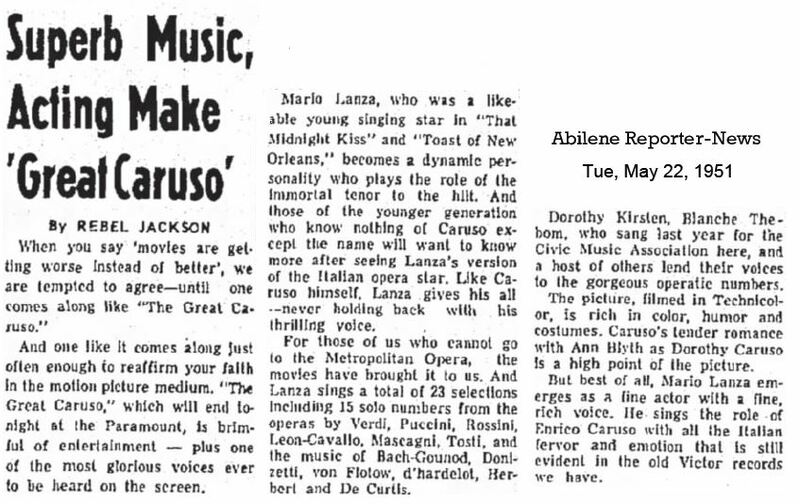 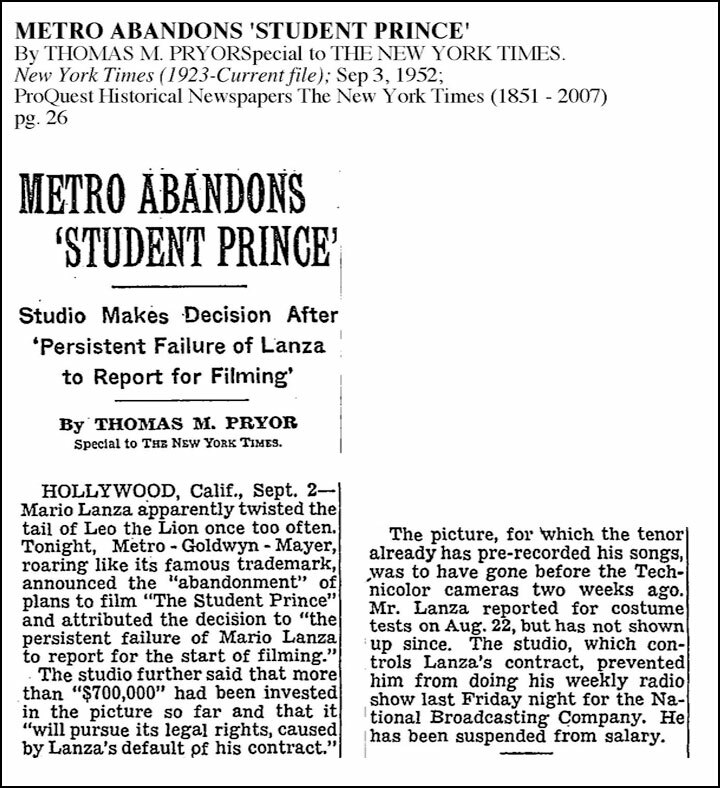 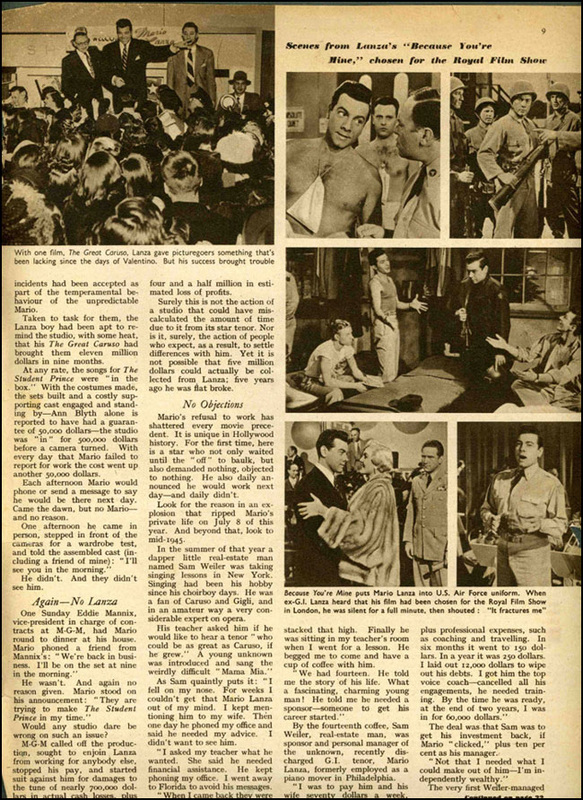 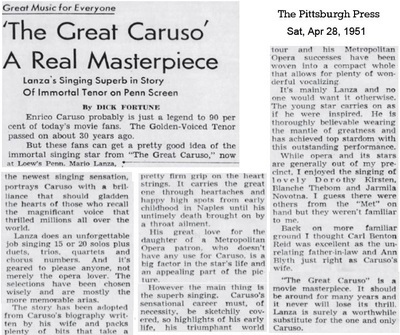 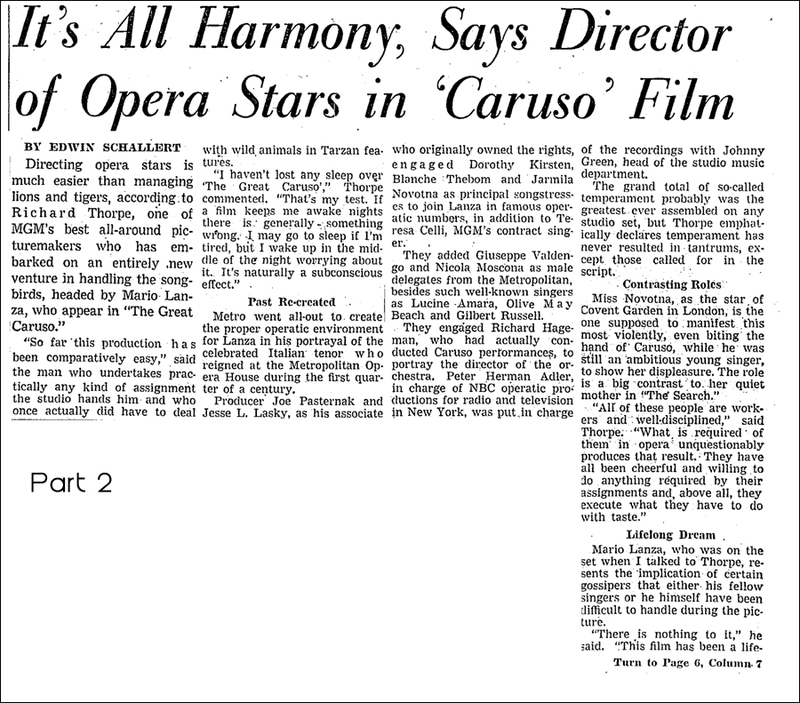 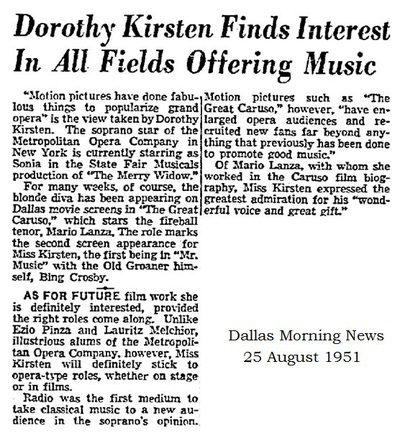 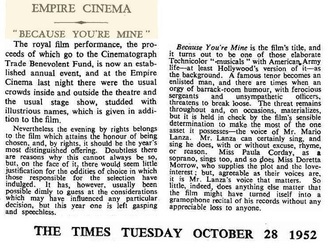 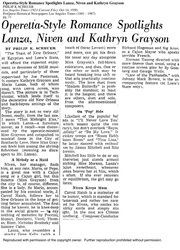 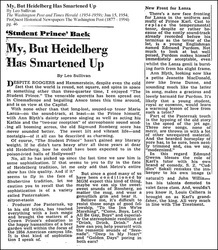 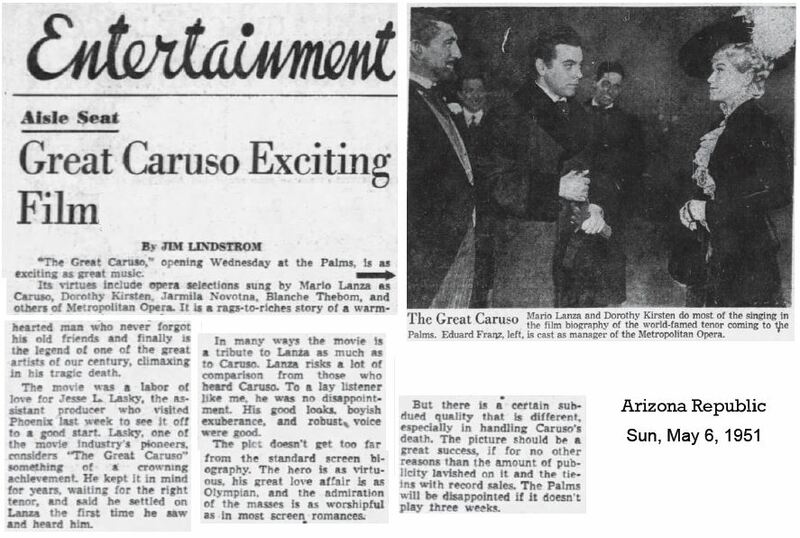 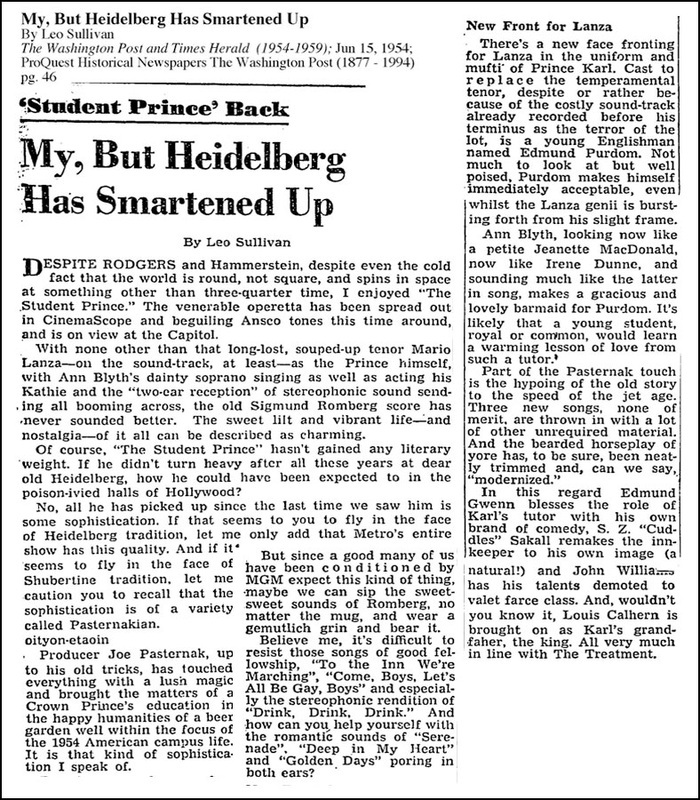 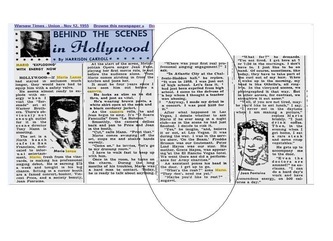 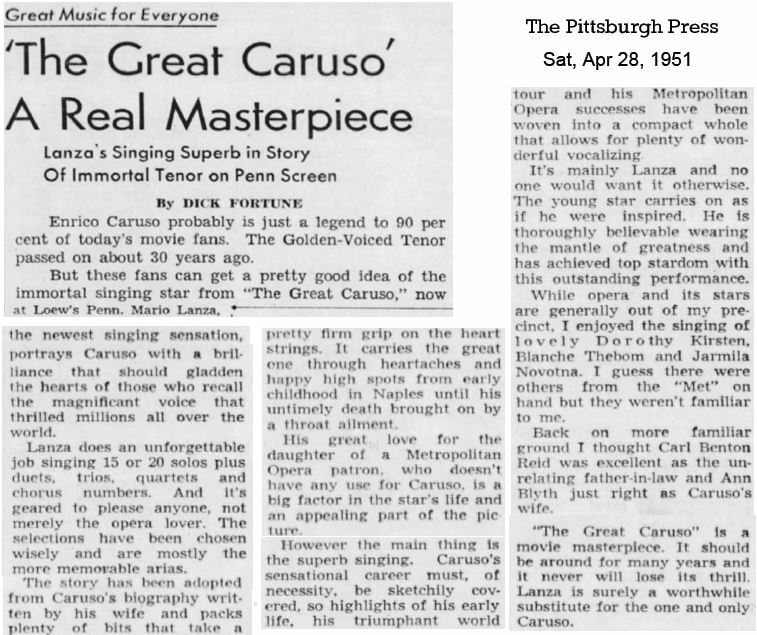 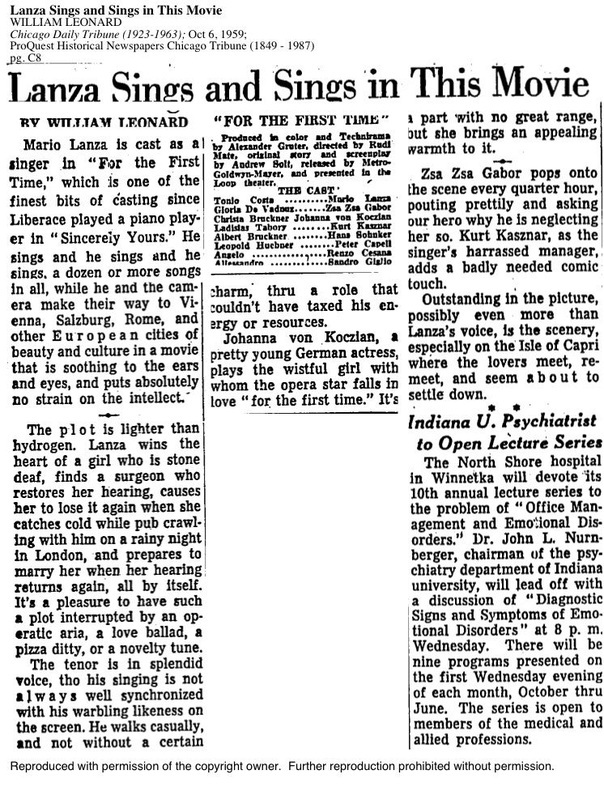 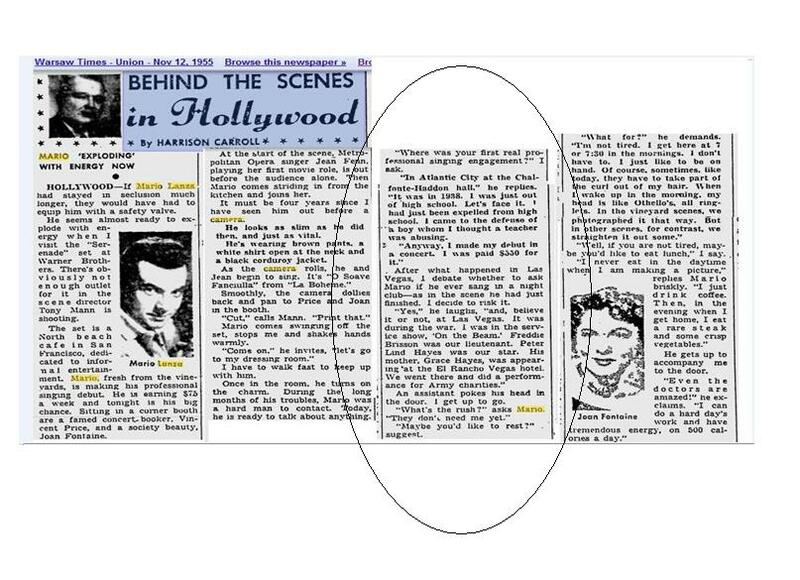 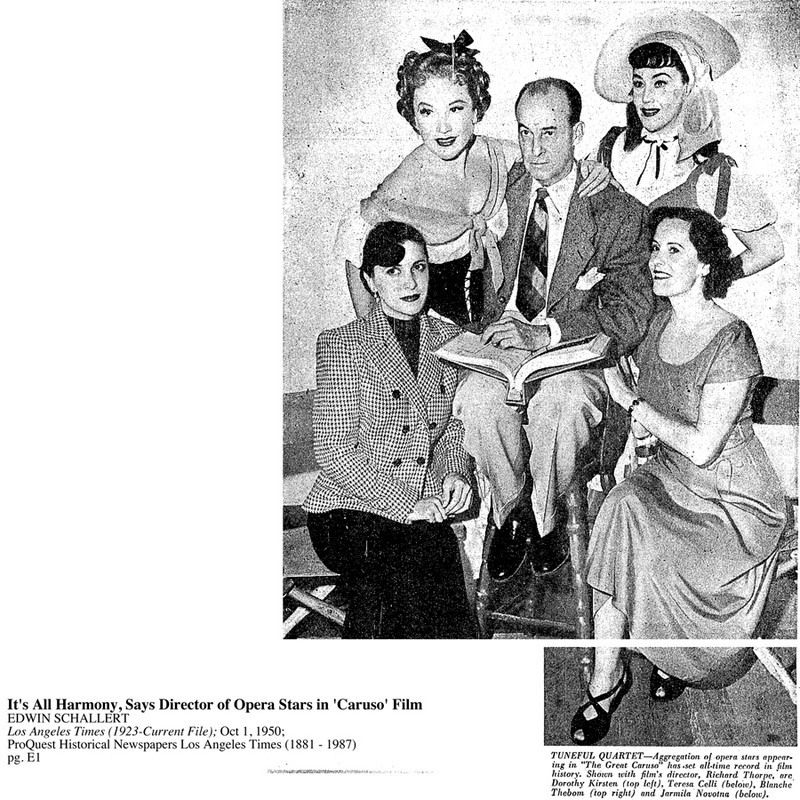 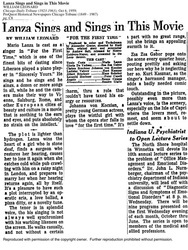 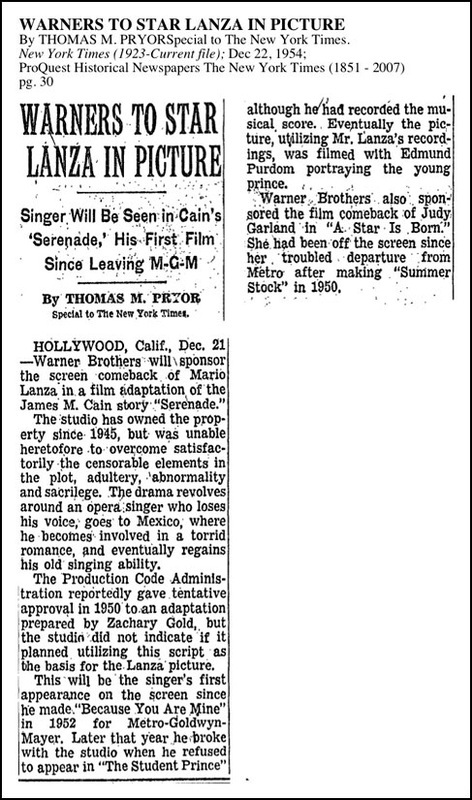 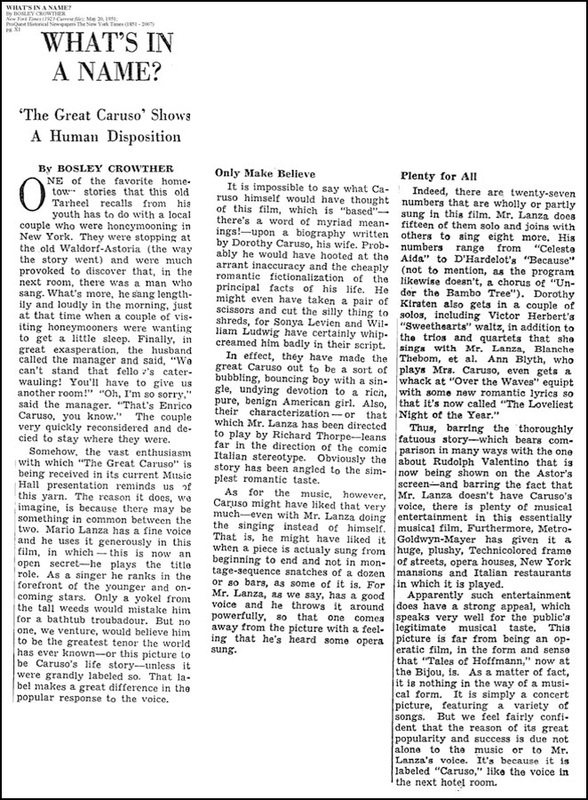 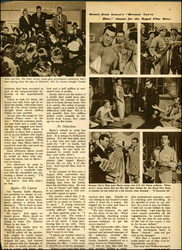 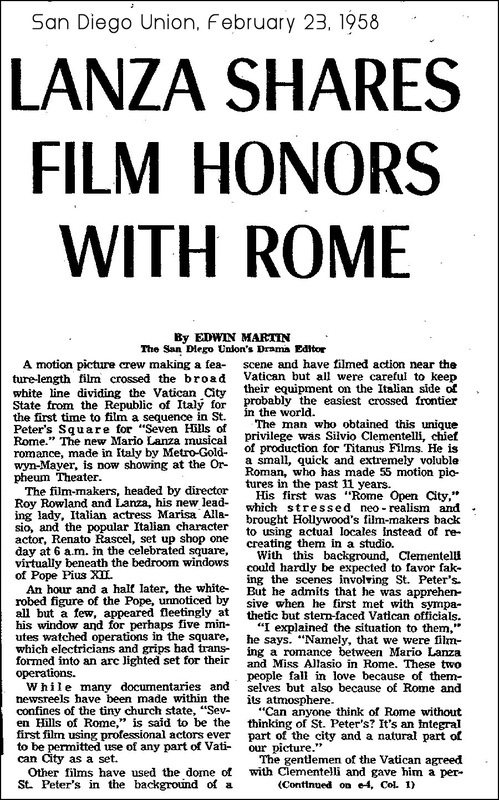 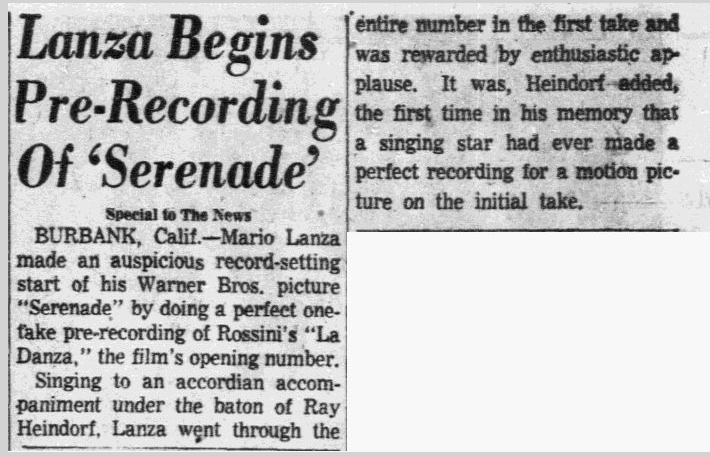 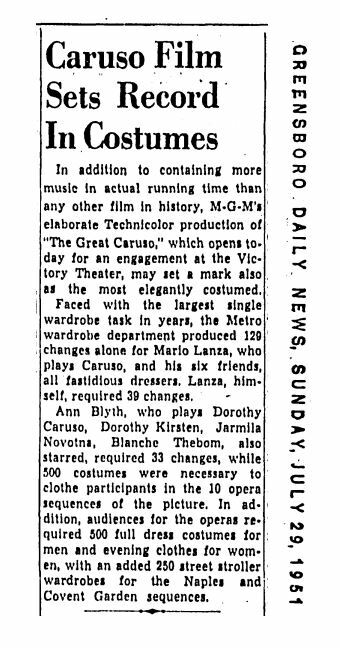 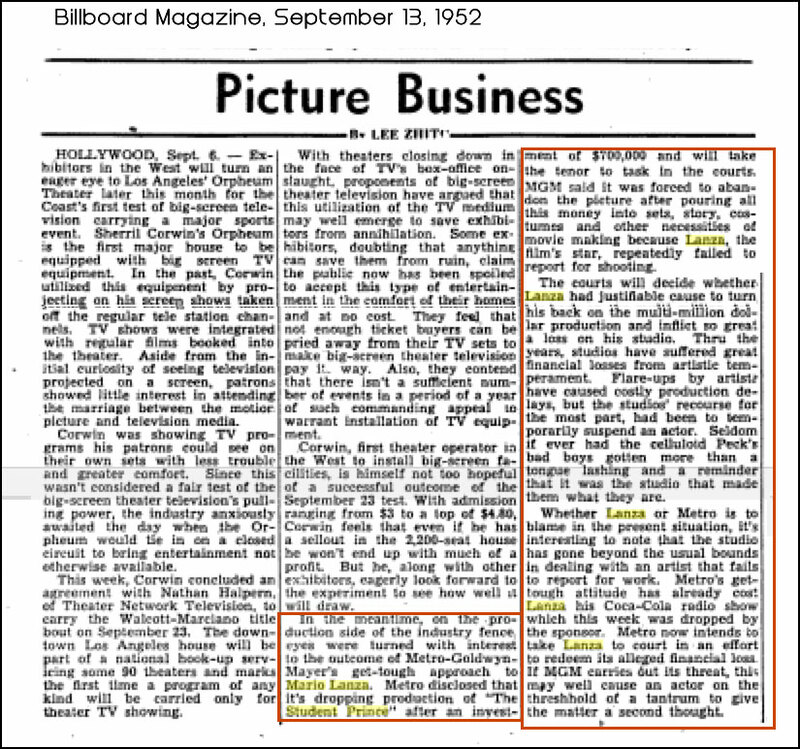 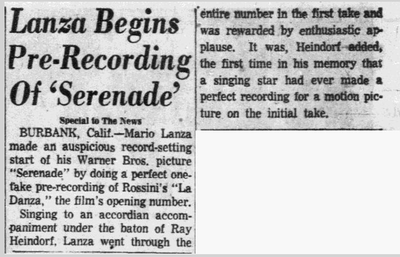 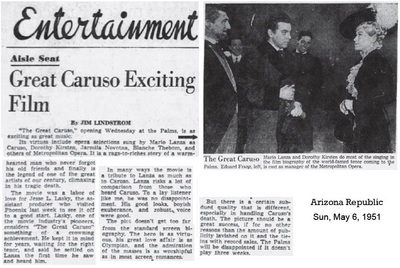 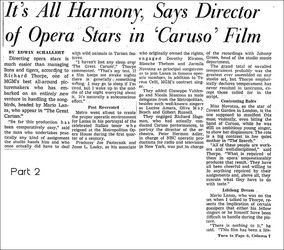 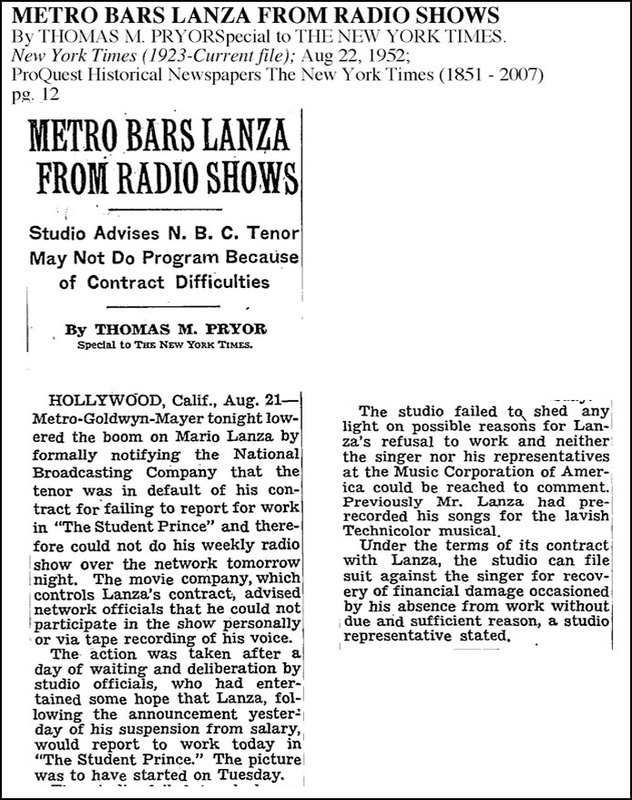 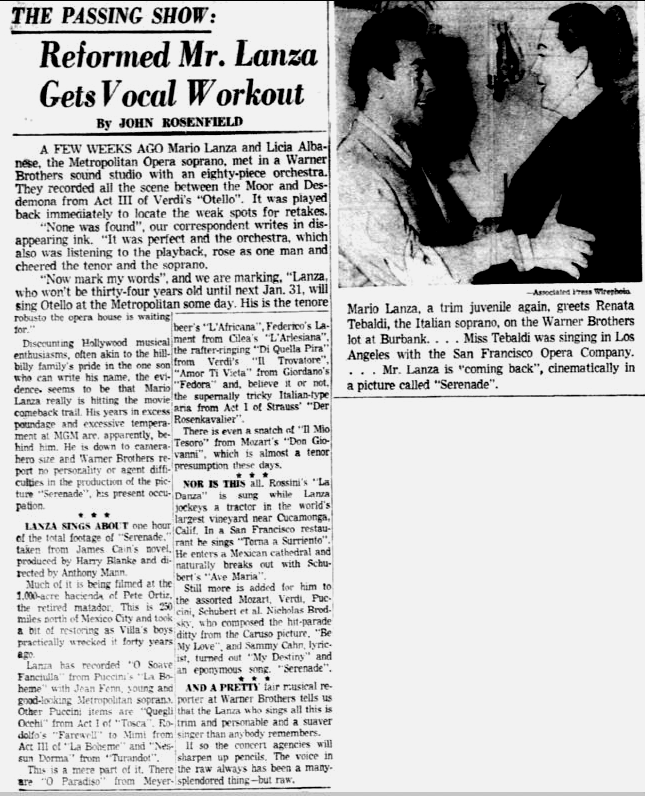 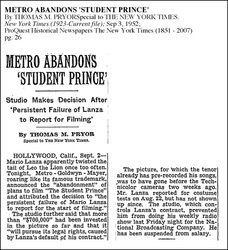 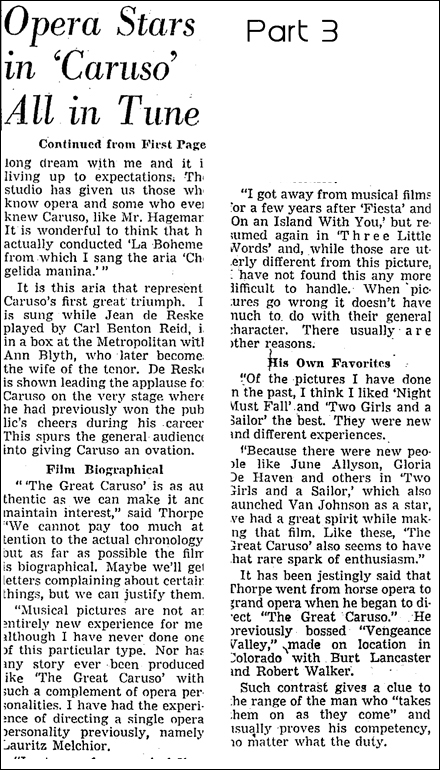 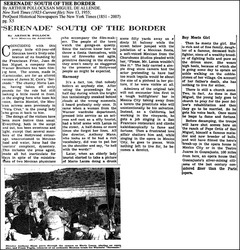 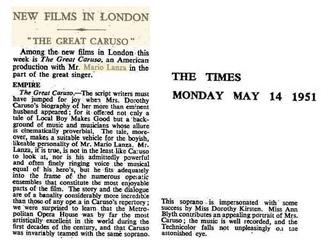 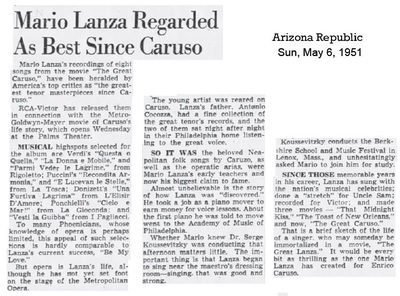 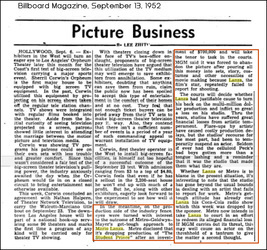 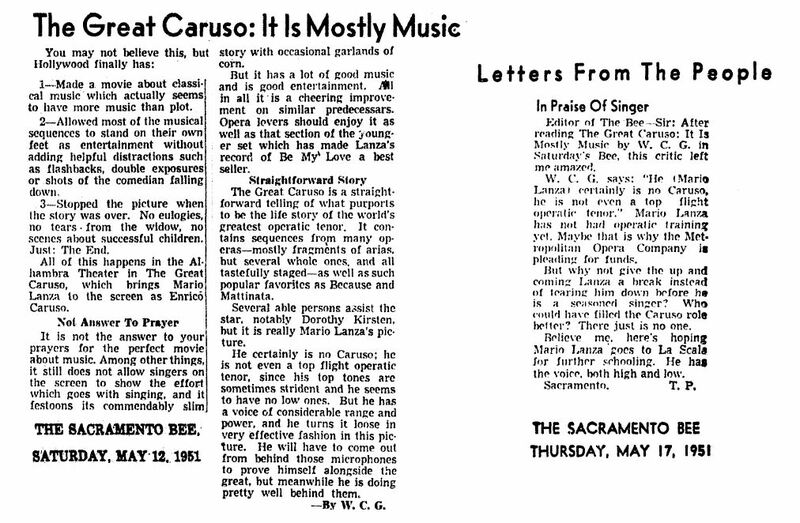 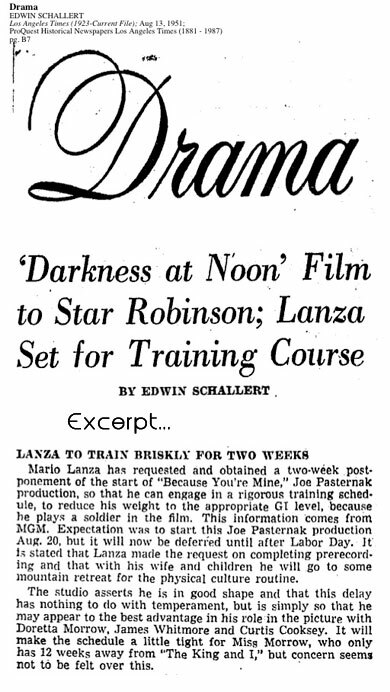 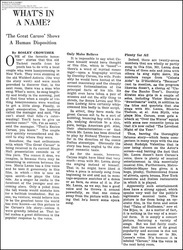 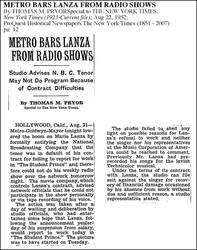 Articles below include press coverage of The Student Prince debacle, which ultimately led to Lanza's dismissal from MGM, and the subsequent settlement under which the tenor allowed his former studio to use his recording of the musical score in the film starring Edmund Purdom.